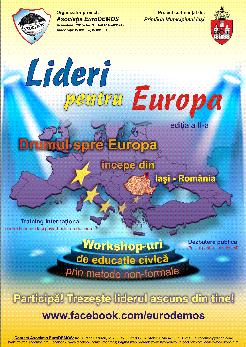 EuroDEMOS Association is implementing the project Leaders for Europe, project co-funded by the Iasi City Hall. EuroDEMOS promotes active citizenship and youth participation at the community development. Understanding the functioning of the decisional systems at local and European level is essential to comprehend public policies and the society development. The consolidation of democracy in Europe is depending by the citizens’ responsible involvement. To be fully involved, youth have to be informed and aware of their role in the nowadays democratic society.